After being hotly anticipated for months- at least by stores– All Hallows’ Eve is finally here. If you’re at all concerned, the so-called North American Halloween Prevention Inc. has released a charity single, “Do They Know It’s Halloween?” (It’s really a spoof of the well-intended-but-slightly-patronizing “Do They Know It’s Christmas?”) It features a slew of Canadian musicians, including Arcade Fire, Buck 65, Sloan, Feist, and Wolf Parade; even better, all proceed go to UNICEF. Those of you don’t want the song, and don’t want to relive the experience of putting together those cardboard boxes, can also donate directly to UNICEF. Be sure to avoid the Worst Costumes of All Time. And pretty much all of these. Retrocrush (the above site) has also put together The Top 100 Monsters of All Time. Cookie Monster and Jaws sit at #68 and #9, respectively. Conducting an exorcism tonight? Some important things to remember. Remember those simpler times when you could just slap on some “Scar Stuff” and score a Pecan Pete? I don’t, but peruse those websites while listening to some vintage novelty records and you’ll feel like you’re back in time. In case you need a startling return to reality, nothing’s scarier than a McDonald’s Halloween cassette from the mid-nineties. When you have a spare 25 minutes, be sure to watch the best Halloween special (and best Peanuts special?) “It’s the Great Pumpkin, Charlie Brown”. Or just be sure to read up on The Great Pumpkin. If at the end of the day you’re just having a quiet lil’ Halloween with the family, maybe check out some Old Time Horror Radio. Because sometimes the scariest stuff is left to the imagination. 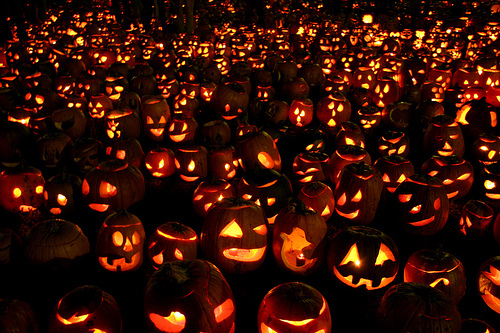 “Sea of Pumpkins” photo from Flickr.